Azar Nafisi is a Visiting Professor and the director of the Cultural Conversations at the Foreign Policy Institute of Johns Hopkins University's School of Advanced International Studies in Washington, DC, where she is a professor of aesthetics, culture, and literature, and teaches courses on the relation between culture and politics. 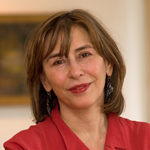 Azar Nafisi has written for The New York Times, Washington Post, and The Wall Street Journal. Her cover story, "The Veiled Threat: The Iranian Revolution's Woman Problem" published in The New Republic (February 22, 1999) has been reprinted into several languages. She is the author of Anti-Terra: A Critical Study of Vladimir Nabokov’s Novels. She also wrote the new introduction to the Modern Library Classics edition of Tolstoy’s Hadji Murad, as well as the introduction to Iraj Pezeshkzad’s My Uncle Napoleon, published by Modern Library (April 2006). She has published a children’s book (with illustrator Sophie Benini Pietromarchi) BiBi and the Green Voice (in Italy with Adelphi, as BiBi e la voce verde). Azar Nafisi’s new book, Things I Have Been Silent About: Memories, a memoir about her mother, was published in January 2009. She is currently working on a book entitled Republic of the Imagination, which is about the power of literature to liberate minds and peoples. She lives in Washington, DC.